Russia on Wednesday wrote off $865 million of debt owed by Uzbekistan as President Vladimir Putin sought to bolster ties between the former Soviet republics during a one-day visit to the country, news agency TASS reported. 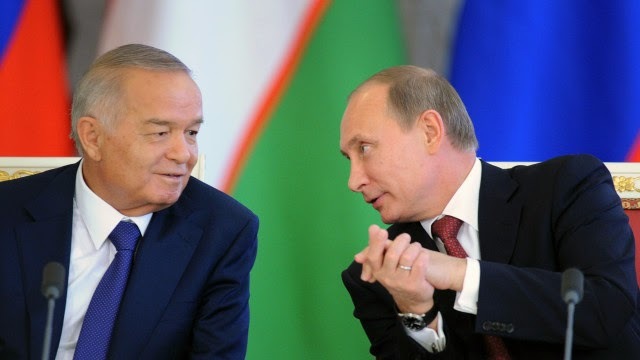 The agreement, which was signed in the presence of Putin and his Uzbek counterpart Islam Karimov, freed Uzbekistan from almost all of its $890 million debt to Russia. Uzbekistan will have to pay just $25 million, Russian Finance Minister Anton Siluanov said Wednesday. Presidential aide Yury Ushakov said Wednesday that settling the debt issue will allow Russia to expand sales of arms and military equipment in the country, TASS reported. Prime Minister Narendra Modi on Thursday said the areas of priority for cooperation between India and Russia include combating terrorism and extremism; advancing peace and stability in Afghanistan; working together for a stable, balanced, peaceful and prosperous Asia Pacific; and cooperating for development in other countries. "I conveyed my deepest condolences for the loss of lives in the terrorist attack in Chechnya. This also reflects our many shared challenges," Prime Minister Modi said in his media statement during the official visit of Russian President Vladimir Putin to India. "This is President Putin's eleventh Annual Summit and my first. This Summit reinforced my conviction in the extraordinary value and strength of this partnership. I am confident that our bilateral cooperation and international partnership will acquire new vigour and scale new heights in the years ahead," he added. Russia will remain India’s foremost defence partner, Prime Minister Narendra Modi told Russian President Vladimir Putin on Thursday while announcing that Russia had accepted India’s offer to jointly manufacture light-utility helicopters. India and Russia announced a $10-billion oil deal for Indian company Essar with Russian oil giant ROSNEFT to import about 10 million tonnes of crude oil over the next decade. The two sides also signed seven agreements on atomic energy, military training and health while Mr Modi and President Putin oversaw the signing of 13 commercial contracts. The highlight of the meeting — part of an annual summit between the two countries — was the unveiling of a vision statement on atomic energy cooperation, where Russian nuclear agency ROSATOM and the Department of Atomic Energy and NPCIL have agreed to build at least 12 new reactors supplied by Russia over the next 20 years. Ukrainian President Petro Poroshenko lashed out at India on Friday over a visit by the leader of Crimea, the former Ukrainian territory annexed by Russia, who accompanied President Vladimir Putin's annual summit delegation this week. 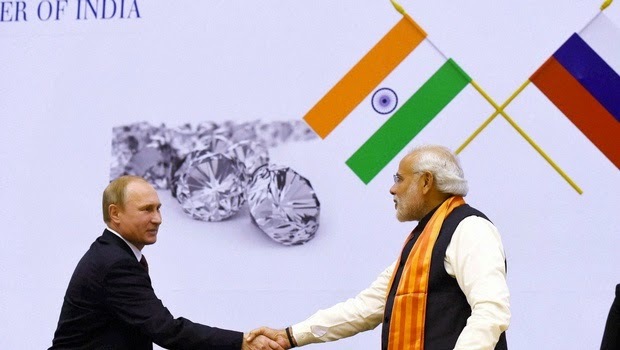 India does not back Western sanctions against Russia, and the unofficial trip by Sergey Aksyonov could spoil the mood before Prime Minister Narendra Modi hosts U.S. President Barack Obama for India's Republic Day festivities in January. Poroshenko, addressing the Lowy Institute think tank in Sydney, said India was placing more importance on "money" than "values" by welcoming Aksyanov, and it was not standing with "civilization" against Russian aggression. 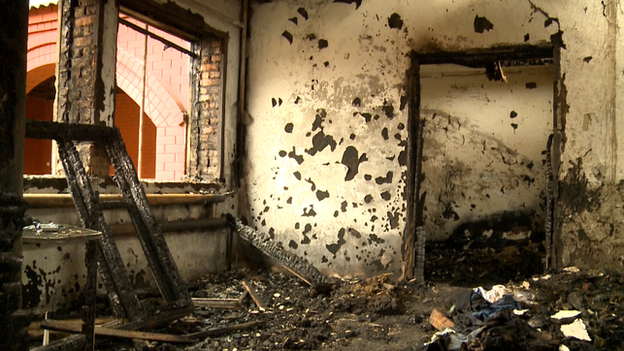 Residents of Russia's Chechnya region say the authorities are carrying out Kremlin-backed leader Ramzan Kadyrov's orders to destroy the homes of relatives of alleged militants held responsible for attacks. Residents of the village of Yandi said that masked men arrived in more than a dozen vehicles late on December 8 and set several homes on fire. On December 6, after 14 policemen were killed in some of the deadliest fighting in the Chechen capital in years, Kadyrov announced that relatives of militants involved in killings would be evicted from Chechnya and their homes "razed down to the basement." Chechen Republic head Ramzan Kadyrov has indirectly implicated Igor Kalyapin, head of Russia's Committee to Prevent Torture, in organizing last week's attack by insurgents in Grozny in which 14 police and security personnel were killed and 36 wounded. In an Instagram post on December 10, Kadyrov claimed that a man by the name of Kalyapin channeled from Western intelligence services to Akhmat Umarov, the brother of former Caucasus Emirate head Doku Umarov, the funds to finance the attack by insurgents on Grozny. Kadyrov demanded a probe to determine whether the Kalyapin in question and the Kalyapin "who came to the defense of bandits and their relatives" are one and the same person. An Uzbek dissident who was living in Turkey for around 12 years was assassinated in Istanbul’s Zeytinburnu district on Dec. 11, with a Chechen-origin Russian national being detained as the sole suspect. Abdullah Bukhari, 38, was working as a religious leader and was the head of the İhsan Learning Services and Solidarity Association in the Zeytinburnu district of the city. The Uzbek dissident was wounded in a gun attack at close range in front of the association building. Bukhari had allegedly received death threats from Russian and Uzbek intelligence agencies and reportedly donned a steel vest whenever he went outside. He was attacked at a time when he was not wearing the steel vest, while he also reportedly did not inform any students at the association that he was going to the building. The Trans Anatolia Natural Gas Pipeline, TANAP is Turkey's priority rather than Russia's last project proposal, according to Turkey’s Minister of Foreign Affairs. Cavusoglu spoke on Putin's announcement of the suspension of the South Stream natural gas project and his proposal for an alternative route through Turkey to send natural gas to Greece and to European countries. 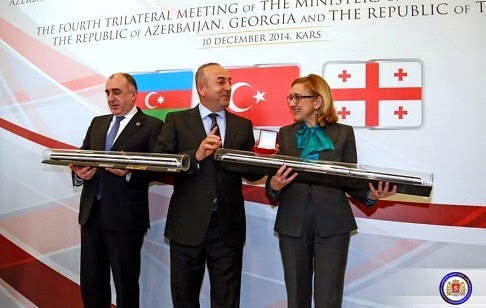 "We signed a memorandum of understanding with Russia but it doesn’t mean that TANAP stays in the background," Cavusoglu said at a meeting with Azerbaijan’s Elmar Mammadyarov and Georgia’s Tamar Beruchasvili on Wednesday. The EU is considering plans for a new pipeline to enable gas imports from Azerbaijan. The push comes in the wake of Russia's decision to cancel the South Stream pipeline project. EU Energy Commissioner Maros Sefcovic said Tuesday that a new high-level working group would be set up to advance the integration of central and south-eastern European gas markets and pipeline networks. As part of the effort, Sefcovic discussed proposals to link Azerbaijan's gas fields by pipeline with European markets. The move is partly in response to the uncertainty generated by Russia's surprise decision to scrap the South Stream pipeline project that it had agreed with the EU. Several EU member states that had invested in the South Stream pipeline, or stood to benefit from it - including Austria, Bulgaria, Croatia, Greece, Italy, Romania and Slovenia - asked Sefcovic to reach out to Russia and discuss whether it might reconsider its decision. His words echoed the Kremlin’s position that the United States and European Union are responsible for the rise of ISIS (also known as ISIL) by supporting the rebels fighting the Bashar Assad regime in Syria.